Ed Hawkins tweeted about Sir David King’s talk at the University of Reading Walker Lecture yesterday. David King, if you are unaware is the UK’s Special Representative for Climate Change, appointed by the Foreign Secretary in September 2013. He was previously the Government’s Chief Scientific Adviser (2000-2007), advocating action on climate change (global warming as it then was) during his tenure. 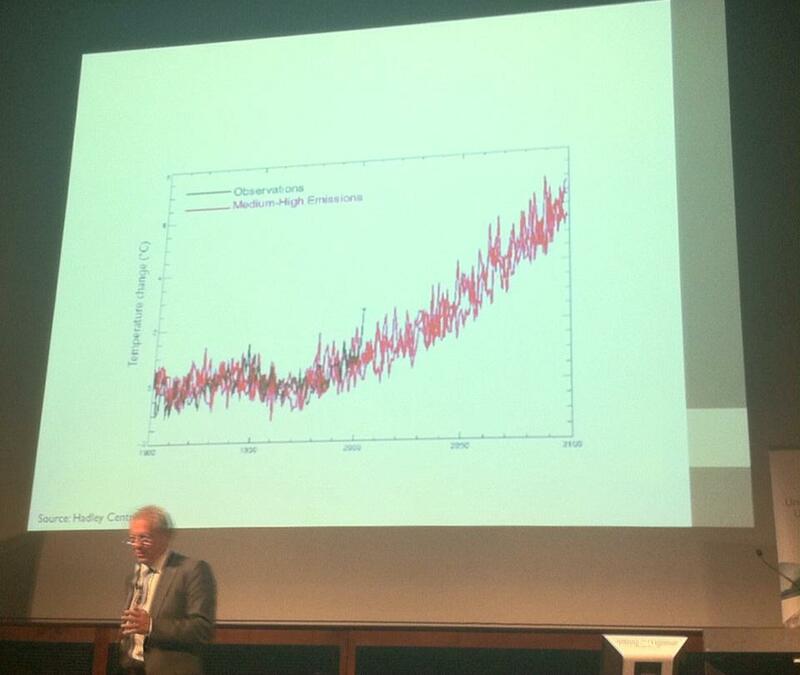 Here is the graph he was presenting to back up his argument that we should expect, by 2050, heatwaves of the type that hit Europe in 2003, to be the norm – under current GHG emissions scenarios. I questioned Ed Hawkins about the graph as the axes were not very informative and there was no title. Ed kindly informed me that the graph showed modelled Central European temperatures 1900-2100 vs. observed (black), ending in 2003. So why show observations only up to 2003? The peak is very obvious – 2003 was, by all accounts, a phenomenally hot summer in Europe. European summers since have been nowhere near as hot – often fairly cool – hence the suspicion is that later observations were simply left off of the graph because they did not match the projected rapid rise in summer temperatures. I cannot say for sure whether this is the case but I can say that temperatures in Germany (a fair proxy of Central Europe) have failed to live up to the climate model expectations in recent years. 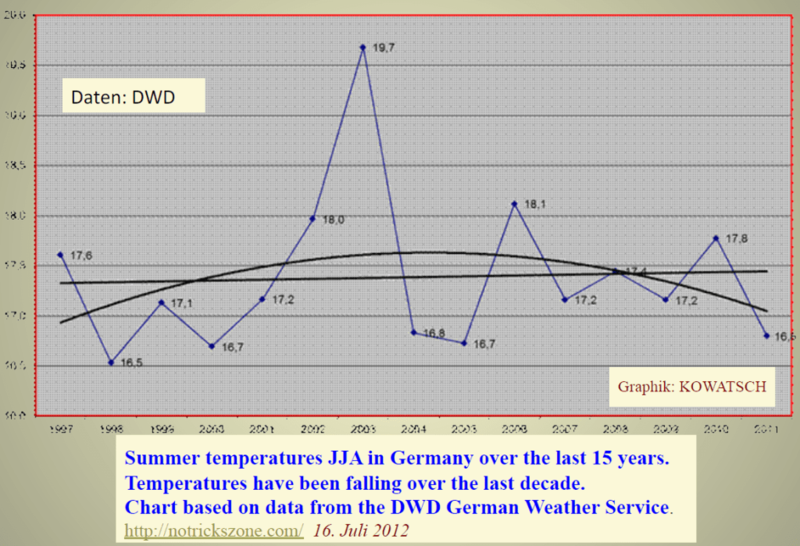 First, let’s look at a graph of average German summer temperatures 1997-2012: As you can see, 2003 stands out clearly, but the 8 years after show a decline in summer temperatures. 8 years of course, is too short a period to judge for sure whether summer temperatures are declining in Germany but the linear trend since 1997 is only very slightly positive and the polynomial fit shows a rise and decline. 2012 and 2014 were average and slightly above average summers in Germany with just 2013 standing out as significantly warmer than the long term average: June, July & August. On a further note, it woud appear that early Spring and Winter temperatures have actually been significantly declining in Germany since 1998.